full bodied greatness in the Cuban tradition. Rich, complex fillers from Jalapa and Esteli are expertlycrafted and finished with an Ecuadorian Habano 2000 seed Oscurro Maduro wrapper. This cigar will surprise the most demanding aficionados subtlety changing throughout the smoking experience. Exquisitely packaged in 20 count classic black humidors. For those yearning for a taste of the past, the Serino Royale Maduro is a medium to full bodied cigar delivering rich aromas and flavors reminiscent of pre-revolution Cuba. Tenderly aged Nicaraguan fillers have been selected to produce a complex array of tastes. It is wrapped in an oily, Ecuadorian Habano Oscuro wrapper, as pleasing to the eye as it is to the palate. Exquisitely packaged in 20 count classic red humidors. The body is medium, the flavor is full and truly original. Supervised at the La Carona Factory from seedling to curing, fermentation, aging and rolling, Medio delivers a unique complex assortment of tastes that surprise the palate continually. The aged fillers from Esteli and Jalapa are perfectly finished with selected Ecuadorian Habano Claro wrappers. A distinctive, vintage smoke for any time of the day or night. 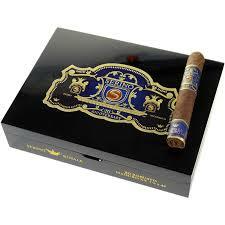 Exquisitely packaged in 20 count classic blue humidors. Perhaps our favorite blend, we were in awe of the multitude of robust flavors one never would expect from a Connecticut wrapped cigar while maintaining a mild to medium creamy body. This truly unique cigar deserves the premium Ecuadorian Connecticut wrapper it is encased in. This blend belongs on anyone’s “bucket list” of cigars. We promise a memorable smoking experience. Exquisitely packaged in 20 count classic white humidors.